INTRODUCING THE NEW SICKLE CELL ANEMIA “GET CONNECTED” PATIENT-POWERED REGISTRY! What Is The “Get Connected” Registry? The registry is a HRSA-sponsored program that enables people with sickle cell anemia or trait to receive information about current advocacy initiatives, treatments, therapies, and research studies. This is another way to stay informed and help researchers help you! The federal privacy regulations of the Health Insurance Portability & Accountability Act (HIPPA) protect your identifiable health information. Any information you give to the Get Connected registry is private and will be protected as required by law. Your information will be stored in a secure database at the SCDAA headquarters. In addition, this is a “patient-powered” registry, which means that you are always in control of your own data and can opt-out at any time. Why Should I Join The “Get Connected” Registry? How Do I Join The “Get Connected” Registry? Complete the initial enrollment form online at www.GetConnectedSCD.org and then check the “I Agree” box at the end of this consent form to accept the terms. You will be asked to provide your contact information and sickle cell status. As you fill out the brief form, you will be asked if you are affiliated with a national sickle cell organization. 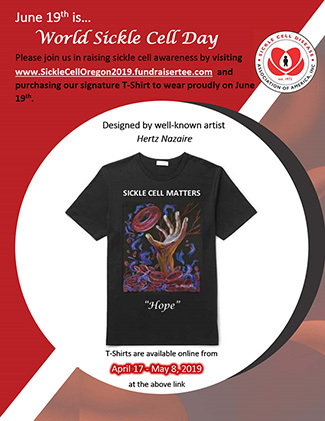 Please select the “Sickle Cell Anemia Foundation of Oregon” from the popdown list. That’s us! If you have any further questions or comments, please contact us at 503 249 1366 and we’ll be happy to speak with you. When you are ready to register for GET CONNECTED, click HERE.